The simple spectrum analysis display shown in the process control panel above shows the short-term frequency spectrum of the signal at the current play head position. It will change as you move the play head, either while audio is playing, or while you scrub replay or move the play head position. The Analyser process can display a spectrogram that represents the spectral density of the audio signal over the duration of the process in question (governed by the process start and end times). 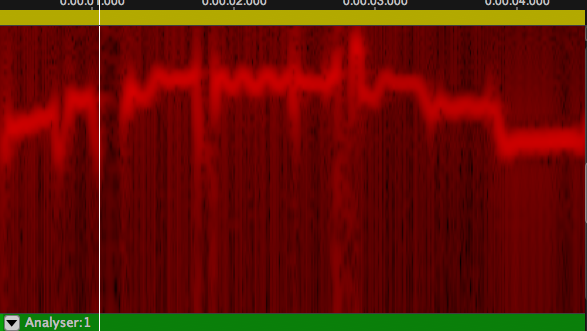 Adjust the Spectrogram Intensity control to affect the visibility of this, superimposed on the audio track in question. In the picture below it is superimposed at 100%, so the audio underneath has been made invisible. 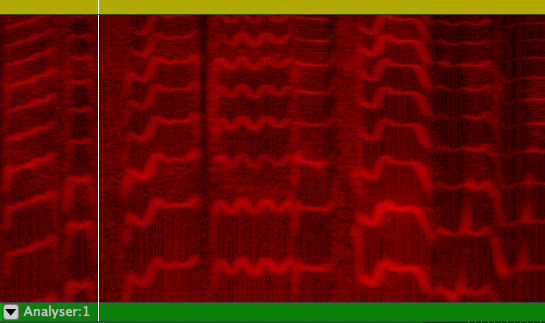 In a spectrogram the horizontal axis represents time, the vertical axis represents frequency, and the intensity of colour represents the amplitude. Here you can see a brighter band that shows the dominant pitch in the vocal track analysed rising towards the middle, then falling in steps.